DMARC is a technique for email servers to differentiate legitimate email from spam and last week, Yahoo changed their DMARC policy to "reject". In English, they have started telling email servers across the globe to drop emails sent with an @yahoo.com address that are not authenticated by a Yahoo server. This happens every day in many, many ways which is why people are loudly complaining that Yahoo broke the Internet. If you use the email blaster in MSR and send from an @yahoo.com address, your emails have reached (far...) fewer people over the past week. Perhaps you don't use a yahoo.com address? Don't click away just yet. While this DMARC change right now primarily impacts mail sent to and from yahoo.com, there is speculation that other large ISPs will follow suit if Yahoo stays the course. To recap: this is an Internet-wide problem, it impacts everyone including MotorsportReg and it's only going to get worse if more ISPs join the bandwagon. You know email is important. Either because it's your #1 marketing tool or because we have told you about it a few times. Instead of using your address as the From, we now list you as the Reply-To. Most email clients respect the Reply-To header so responses should still come to you. What you probably won't get are bounces (which we already try to handle on your behalf), autoresponders and vacation notices. We don't expect any tears to be shed over that! Because we are sending from a domain we control, we can apply the full set of email authentication techniques which helps your email reach more inboxes. You're thinking, "so, my email reaches more people and I still get replies but no junk, why didn't we do this sooner?" First, noreply addresses aren't human. As event organizers, you are in the "business" of engaging with fellow enthusiasts and encouraging them to participate. What message does noreply send? It says, "I'm talking to you, we're not having a conversation." Now, we've softened that by providing a reply-to address, but not all email clients show the reply-to in their default views. This isn't ideal. There are some alternatives, one of them being a technique called VERP, which we already use today to handle bounces. It would let us forward misdirected messages to you but it would not fix email clients associating our address with your name (and, in fact, may increase the problem since each email you send would have a new, unique address). 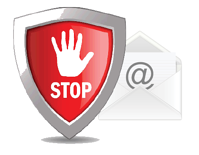 If you send email from a domain you control, like yourname@clubname.com, then you are generally not impacted by this. 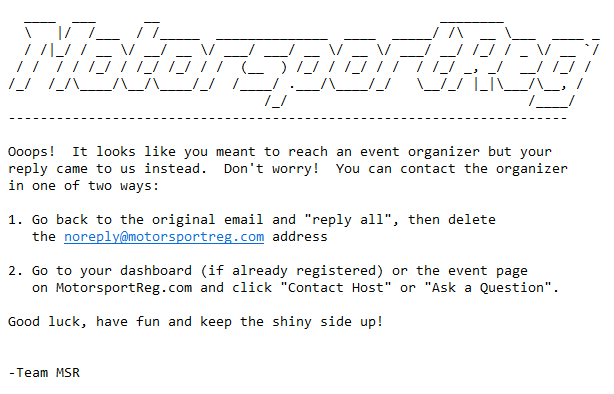 However, you should take advantage of email authentication and create an SPF record in your DNS to tell email servers that sending via motorsportreg.com is OK.
We could let you specify your own SMTP server where presumably you would have email authentication already enabled. However, not all ISPs provide this and certainly not all ISPs permit you to send bulk email in the way that you do via MSR. Since not many ISPs allow for #2, we could also integrate with a particular third party email sender and require you to get an account with them. If you're a low volume sender, the cost would be free or minimal and it would scale up with your traffic. We don't like this approach as it would add a new cost however it would have the upside that if Organization A sends out spam, it would not harm the deliverability of Organization B. We have no further plans yet while we're monitoring the effect of these changes (which were urgently needed based on what we were seeing). It's possible Yahoo will reverse course given the public outcry which means we might be able to undo our changes as well. In the mean time, as always, if you have any questions, drop us a line and we'll be happy to get them answered.